The 3 Gili Islands are Gili Air, Gili Meno and Gili Trawnagan and are found sitting just off the coast of Lombok, Indonesia. These beautiful islands are an idyllic paradise with beautiful sand beachs, fantastic diving, island lifelstyle and no motor vehicles of any kind. Each island has it’s own unique flair and there is everything from fantastic restaraunts and parties all night, to calm serene beaches with a view of Bali’s Mt. Agunug for a georgeous sunset. All transportation is done by foot, by bicycle or by horse cart. Yes, every single item on each island, be it a refirgerator or groceries; comes over by boat first, and then usually by horse and cart to it’s ultimate destination. What this means is that we have a large number of horses (most are actually ponies by defintion since they are under 13,2 hands in height) which live and work on the islands. The climate here is very warm, and either very dry or extremely wet depending upon the season. 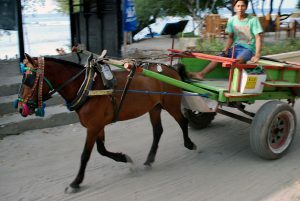 The working horses either pull carts designed to carry goods such as Bintang Beer and other such items, or they pull a Cidomo which is a traditonal passenger cart to take tourists and residents to various spots on the islands. 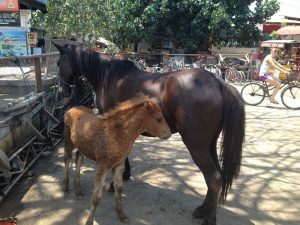 Horses of Gili is a not for profit orgnization founded by residents of the largest island, Gili Trawangan. We operate beneath the NGO Gili Eco Trust. Together we are striving to help provide the best living conditions and standards of care for these horses as possible while still understanding that the locals rely on the horses for income and that they are a tradition handed down through generations. We provide free veterinary clinics several times a year since there are no veterinarians on any of the islands. We also provide donated bits and bridles, padding for harnesses, and boots to help protect the horses from accidental injury. One of our primary goals is education regarding basic diet and care, including not giving salty water, and keeping the horses feet trimmed and properly shod. This is a long term project with many obstacles in the way such as lack of funds, cultural barriers, language barriers and a remote, difficult to get to location. All of our funds are donated either through the Gili Eco Trust which collects donations of 50,000rp per diver on the islands or through fund raisers. The majority of the horses and ponies that live here work and are nearly all stallions. This is a cultural thing since the locals believe that the males are better for work and the females have babies. The horses are mostly bred in Bali and Lombok, although some come from farther away islands such as Bima, and there are a very few imported European horses as well. A few horses on each island are used for riding, either by private owners or for rides offered to tourists on the beach. 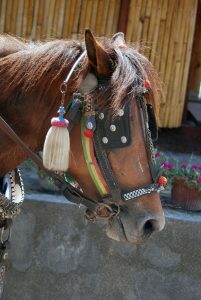 The horses stay in stables which are made of wood, bamboo and/or occasionally concrete. There isn’t any pasture or real paddocks available on the islands. Many of the horses are simply tied to trees or poles due to the lack of proper housing being available. They are fed a mixed quality fresh grass hay imported form Lombok and imported rice bran mixed with water. Most are now offered fresh wate which is quite expensive to purchase, and this is why a few still drink salty or brackish water, and that in the past nearly all drank this. (Many horses used to be lost to kidney disease). These are not really the best diets for horses long term and can lead to vitamin and calcium deficiencies. To combat this we import limited qaunities of a pelleted horse feed, and vitamin and mineral supplements which we sell at a low cost to the owners. We also give vitamin injections to every horse we are able to see at the clincis.